What exactly is game-based learning, anyway? Is it a roomful of children playing video games? Is it students designing games? Or is it both of these? The following are three approaches to bringing game-based learning to your classroom. They’re not distinct from one another—try mixing two or all three. While on an iCivics panel at the International Society for Technology in Education conference in 2015, Benjamin Stokes compared the experience of playing games to taking a class on a field trip. With a field trip, you first let students know what to expect and then give them freedom to explore an out-of-school location. Back in the classroom, you facilitate connections to the curriculum. Games, like field trips, provide meaning for students. I put students in Minecraft and have them build structures. When night comes and creepers attack, only the students who stayed in fortified structures survive. After play, we discuss the difficulties of setting up a colony in a hostile environment, like Jamestown. Students understand the dangers of settling new worlds because they have experienced them. Many books and movies use the hero’s journey template to tell a story. Examples range from Harry Potter to The Hunger Games to Star Wars. Games also use the hero’s journey. Have your class play the award-winning Brothers: A Tale of Two Sons, a fairy tale that relies on cooperative play; Never Alone, based on an Alaska Native folktale; or Journey, which puts players on the monomyth quest. To assess learning when using a game as a text, use Office 365 or Google Docs. English literature teacher Paul Darvasi has his students play the point-and-click exploration game Gone Home, which is about a dysfunctional family. Set in 1995, the game uses literary devices like mood, tone, and theme. He has students take screenshots as evidence, and add them to a shared document. Collected screenshots later lead to projects like comparing reviews and then writing their own. Games are particularly useful to model real-world systems. I have students play Werewolf and discuss different actions that mirror the events of the Salem witch trials, McCarthyism, and other witch hunts. I also have students play the board game Pandemic, as well as the mobile game Plague, Inc. 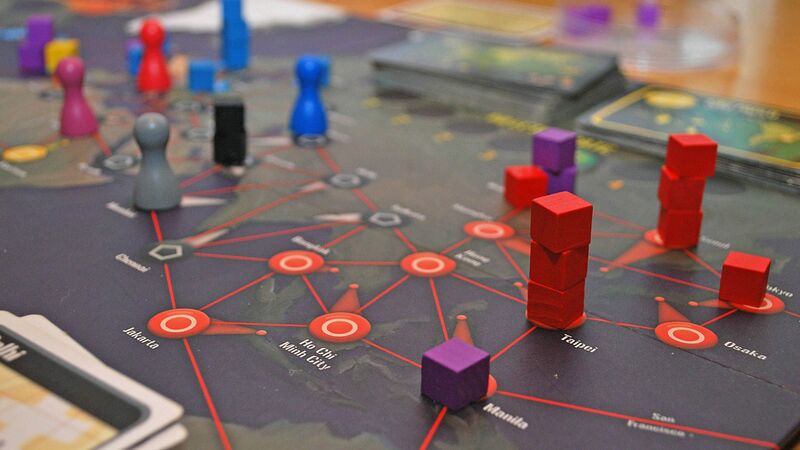 These games illustrate how diseases travel the interconnected networks of the world. Students learn how the bubonic plague traveled along the Silk Road. The games model causes that have effects, which have subsequent effects—thus the game teaches the 21st-century skill of systems thinking. To go further, give students an opportunity to mod the games you use as models. I have students play Mission US for a bit. Rather than depend on the game to create a sense of historical empathy in students, I ask them to create experiences using free interactive fiction tools, like Inklewriter or Twine, to make their own choice-based stories. Remaking a game to be about different content is engaging, and it gives students a sense of agency, affording an opportunity for deeper learning. When using games in your classroom, remember that the game is not the teacher—you are. The game is just an activity. When using games, try to avoid intervening when students are figuring something out. This affords students the opportunity to play with games as systems. And do not grade play; instead, assess the learning transfer that you facilitate from the game experience to the curriculum. In what ways have you used games to deepen your students’ learning experiences? Please share in the comments below.